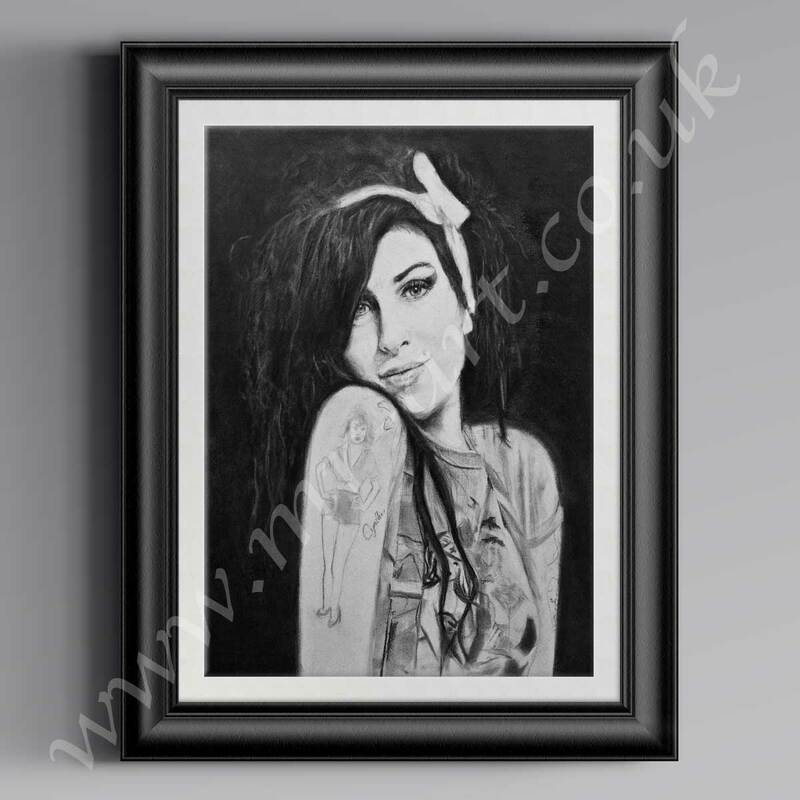 Amy Winehouse print, from original pastel portrait by Mark Reynolds. This Amy Winehouse pastel piece is limited to just 100 prints,making it a rare sought after print. Amy Winehouse t-shirts can also be purchased from the website 100% cotton and available in a range of colours and sizes . Amy Winehouse (14 September 1983 – 23 July 2011) was an English singer song writer, known for her deep contralto vocals and her eclectic mix of musical genres, including R&B, Soul, jazz and reggae. Amy Winehouse’s 2003 debut album, Frank, was a critical success in the UK and was nominated for the Mercury Prize. Her 2006 follow-up album, Back to Black led to five 2008 Grammy Awards tying the record at that time for most wins by a female in a single night, and made Amy Winehouse the first British female to win five Grammys. Amy Winehouse won three Ivor Novello Awards: in 2004, Best Contemporary Song for “Stronger Than Me” in 2007, Best Contemporary Song again, this time for “Rehab”; and in 2008, Best Song Musically and Lyrically for “Love is a Losing Game”. She won the 2007 Brit Award for Best British Female artist, having also been nominated for Best British Album, with Back to Black. After years of abusing drugs, then alcohol, Amy Winehouse died of alcohol poisoning on 23 July 2011. Her album Back to Black posthumously became the UK’s best-selling album of the 21st century, at that point. In 2012, Winehouse was ranked 26th on VH1’s 100 Greatest Women in Music list. The BBC has called her “the pre-eminent vocal talent of her generation”.